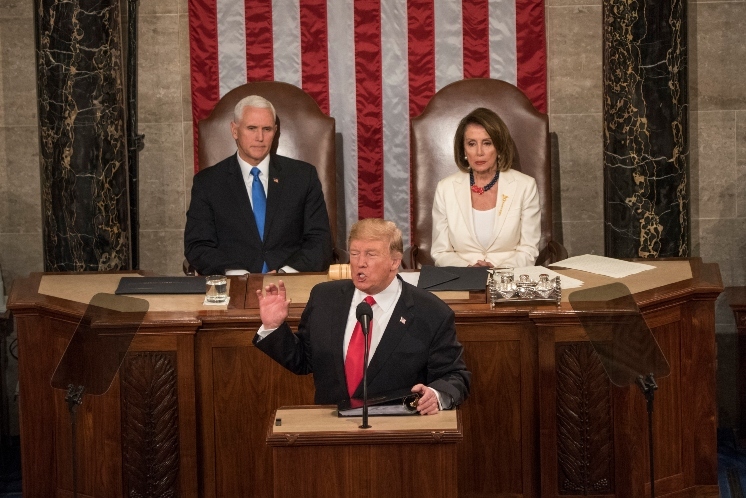 On Tuesday, President Trump used his State of the Union address to celebrate the recognition of Jerusalem as Israel’s capital, call out Iran on its genocidal Jew-hatred, confront anti-Semitism generally, and tie his conception of American greatness to the liberation of the Nazi concentration camps. This was one pro-Jewish speech. On Iran, Trump did something remarkable—he spoke the truth. The president called Iran “the world’s leading state sponsor of terror” and emphasized that “it is a radical regime.” He went on: “We will not avert our eyes from a regime that chants ‘death to America’ and threatens genocide against the Jewish people.” No garbage about make-believe moderate mullahs, no specious conflation of the Iranian people and the regime, no wishful fantasies about Iran’s tyrannical theocracy showing heartening signs, and, finally, no equivocating about the nature of its obsessive anti-Semitism. In all, a welcome return to moral sanity. After that, Trump talked briefly about anti-Semitism in general. “We must never ignore the vile poison of anti-Semitism, or those who spread its venomous creed,” he said. “With one voice, we must confront this hatred anywhere and everywhere it occurs.” He didn’t couch this point in a larger abstract discussion about accepting people who are different from you, etc. Trump focused on anti-Semitism as the singular phenomenon that it is. And as a result, his concise remarks actually meant something. In talking about anti-Semitism, he moved on to last October’s shooting at the Tree of Life Synagogue in Pittsburgh. Trump honored Timothy Matson, one of the SWAT officers who went into the synagogue and apprehended the killer. He also celebrated the life of Judah Samet, an 81-year-old survivor of both the synagogue shooting and the Holocaust. This brought Trump back around to his opening theme—the heroism of American soldiers on D-Day. He introduced a second Holocaust survivor, Joshua Kaufman, along with Herman Zeitchik, an American sergeant who stormed the beaches at Normandy. “Almost 75 years later, Herman and Joshua are both together in the gallery tonight—seated side-by-side,” Trump said, “here in the home of American freedom.” The two men—liberated and liberator—rose together for a round of applause. Trump talked about a great many other things, but it’s remarkable the extent to which his speech acknowledged, celebrated, and urged on America’s doing right by the Jews. It would be welcome enough if he emphasized such things in an address to an exclusively Jewish audience, but this was a State of the Union speech, and so his righteous words were meant to shape our very understanding of America. This takes on additional importance because Congress is now home to some anti-Semites of unprecedented ferocity and because the larger left has failed to call out the Jew-hatred that now permeates its ranks. Say what you want about Trump, this was glorious.